Netflix original movie “Velvet Buzzsaw” is a satirical thriller about the horror-imbued paintings of a deceased artist named Vetril Dease, and how their dissemination among Los Angeles’ art scene leads to the supernatural deaths of every person who gets involved. We spoke with Gilroy about the inspiration behind the film’s character structure, along with the meaning of names like Vetril Dease and the significance of one solitary classical Baroque painting placed in the background of a scene. Kim Renfro: To start let’s talk about the name Vetril Dease. How did you come up with that? Dan Gilroy: I’m an enormous fan of Dickens. Dickens was always just first-rate with the names he came up with, they seemed to actually expand on the characters’ background, so I try to give characters great names so I collect names. To answer your question, about 10 years ago I was working on a film that had to do with the southern United States and I was looking through census rolls, looking for names. I collected like 50 names, and one of them was Vetril Dease. So Vetril Dease was a real person who lived in South Carolina in the 1850s, and I’ve resurrected him somehow. Jake Gyllenhaal and Renee Russo on set with Dan Gilroy. Renfro: That’s really neat. Here I was wondering if it’s an anagram for “advertise” or something. Gilroy: Someone actually pointed out that it is an anagram for “devil satire” which I didn’t even know, and is creepy in a weird way because I had 50 names on that list. One of them was Moddick Green … there are all of these great old names. Renfro: I noticed that Morf’s character starts unraveling when he compromises his critique process by panning Ricky just because Josephina asks him too, whereas the other characters are targeted more directly because of their involvement with selling Dease’s art. Gilroy: It’s a Robert Altman-like ensemble, so we have a half a dozen or more characters and each one of them is affected by the Dease art in a different degree. The majority of them will be killed specifically for selling art against the deceased artist’s wishes. At the same time, I wanted to show that drifting toward a grey moral area was not limited to [selling the art]. So all of these characters are doing other nefarious things. Rhodora is planting a boyfriend to get early advance reviews, Gretchen is rigging the economics of a sale, and Morf is using his position as a critic to satisfy a romantic request from Josephina. Renfro: Right so him trading in his integrity was the start of that downturn. The Caravaggio painting in the background of a scene in Rhodora’s home. Renfro: This movie was fun for me to watch because I’m very bad at recognizing contemporary/modern art, but I am very familiar with more classical art. So I immediately noticed the shot of a Caravaggio painting in Rhodora’s house. Why did you pick that painting for this scene? Gilroy: That’s a very personal choice because I’d have to say Caravaggio is my favorite artist, in painterly sense. I’ve read a lot about his life and his work, and one of the revolutionary things Caravaggio did was when he went to Rome and at the time it was all spiritual paintings but he was living this rather debauched life at night. One of his first big paintings was about card sharks and it showed a young man being cheated at cards. It was a very revolutionary painting at the time because he was taking this incredible masterly skill and applying it to everyday events. 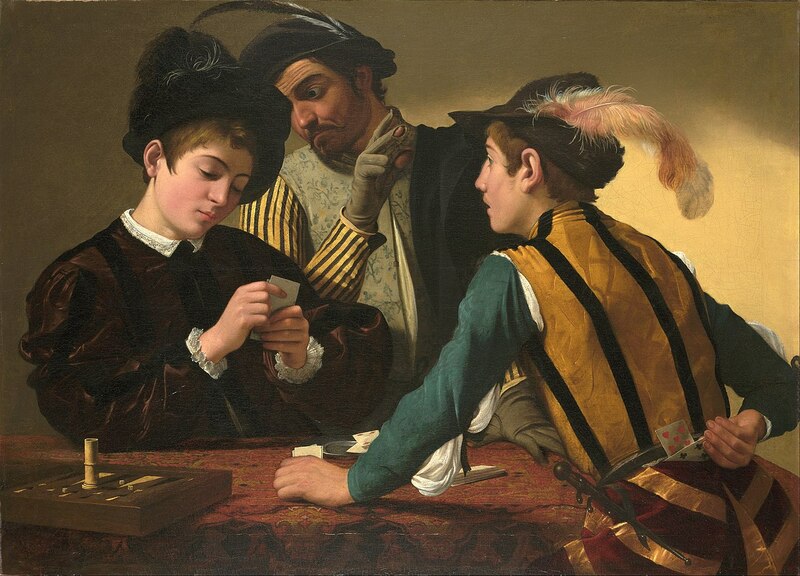 Caravaggio’s “The Cardsharps” was painted around 1595. So the idea was that Rhodora, who is worth probably a billion dollars, could have any art on her walls and she doesn’t choose contemporary art — she chose a representational artist like Caravaggio. That’s why we put it there. Renfro: I also really enjoyed the scene that plays over the credits, with John Malkovitch’s character Piers just doodling in the sand. There was an optimism to it, with someone creating art simply for themselves. What inspired that ending? Gilroy: That comes from when I worked on an epic debacle called “Superman Lives,” and it was so bad that they made a documentary about it. Renfro: That was the Nicholas cage one? Gilroy: Yeah, Nicholas Cage and Tim Burton. Six days before we started shooting, they pulled the plug. I had been working on it for a year and half and I was devastated. I over at Warner Brothers, they pulled the plug on it, I got in my car, drove down to Santa Monica, and was just sitting on the beach. I kept thinking about it and came to the conclusion that it didn’t matter. As a writer I had gotten a tremendous amount out of the experience. It wasn’t wasted time. And I decided then and there I was going to do things more for myself. So when I finally stood up and walked away [from the beach] I decided I was going to move into a place of doing things that had more relevance to me. That was going to be my way out of what I was feeling. John Malkovich drawing on the beach and having the waves wash things away ties into what Rhodora says about dependency murdering creativity. That really is where that comes from, a very personal moment. I’m really happy it got into the film, and it has resonance to you, because art exists for its own sake. It’s not about the dollar amount paid or the opening weekend, art is art and exists for its own reason. Piers is free, he’s liberated, and he’s creating for himself — which is a very important thing for me. “Velvet Buzzsaw” is streaming now on Netflix. Read INSIDER’s review of the movie here.